This Universal Mounting Surface Cup Holder Adapter provides an ideal flat mounting space for almost ALL OEM windshield and dashboard suction device mounts. The cup mount adapter is perfect for Wireless Qi Chargers and other types of device mounts! Provide an extra level of safety and security for your vehicle. A closer, more discreet mounting surface means no more squinting and less worrying about people tampering with your car. Having a mount-free windshield provides both discretion and safety. Keeping your mount out of your direct line of vision ensures a clearer view of the road and an overall safer drive. Twist-to-Fit design utilizes an expanding weighted base to securely mount your device holder with ease. 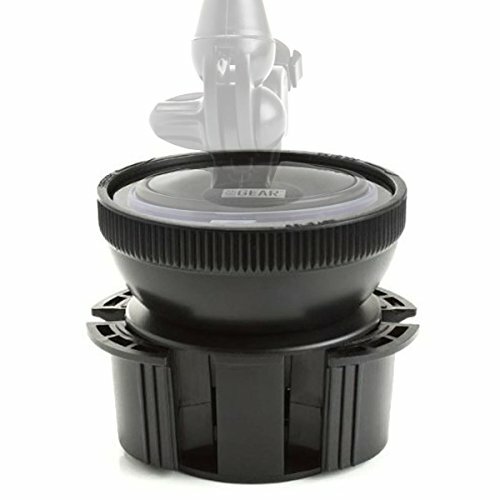 The universal base adjusts to fit most cup holders from 2.5"-3.75" wide. With no sticky pads or screws, transporting your mounts and devices between cars is incredibly easy!